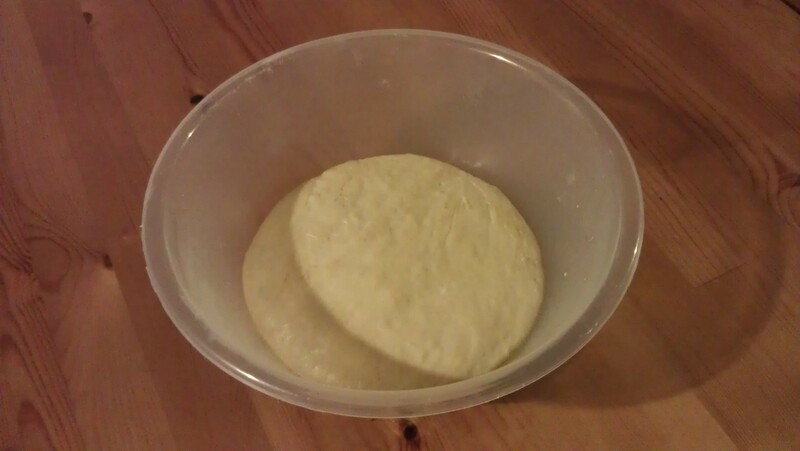 The dough started off simply enough, it all came together, I kneaded it, I set it aside to let it rise. It rose. I punched it down, added the baking powder, kneaded and set aside again. At this point, I was a few hours in – no, I hadn’t actually done that much grafting, but the anticipation had been building exponentially as time wore on. It was at this point that I put the pork belly in the oven, on the suggested temperature, following the recipe to the letter. After 20 minutes, I came back to baste the pork. 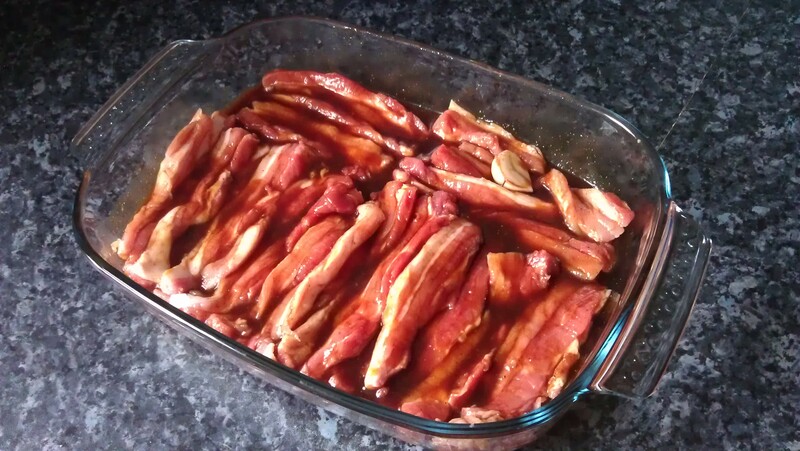 It was all looking lovely, well on its way to caramelization and smelling fantastic. I snuck a tiny piece to taste-test; little did I know that would be the last decent piece of pork belly I would eat that evening. A tiny – peanut sized – alarm bell went off in my head when my stolen porky moment found me chewing on a fully cooked piece of pork belly which was tender enough and beginning to caramelize nicely. However, I pushed this out of my head as the recipe still called for an additional 40 minutes cooking and I convinced myself this would just add to the tenderness, depth of flavor and, of course, the caramelization. When I returned to the kitchen after an additional 20 minutes, basting brush to hand, I opened the oven and was immediately enveloped in black smoke. The kitchen smelled like a barbeque and, indeed, all that was left on the baking tray was charcoal. I nearly broke down then and there, but once the smoke had cleared, there were a few rescuable pieces and darn it if I was going to give up when I had come so far. I rolled out the bun dough, brushed them with oil, folded them and popped them in my electric steamer (blasphemous, I know). They started to rise, but didn’t look too appealing. I could feel my hopes sinking lower as I did the mountain of dishes that had accumulated – although I had been cleaning as I went, I had still managed to use nearly every dish I possess and the kitchen was awash with dishes in states of semi-dryness. After about 10 minutes I decided to pull one of the buns out, even though it had not risen as much as I thought it should have. It was cooked, as evidenced by the fluffy bit I could see in the middle of it. I took a bite and my heart dropped to my feet. It wasn’t bad, it was awful. My husband’s description: wall paper paste. 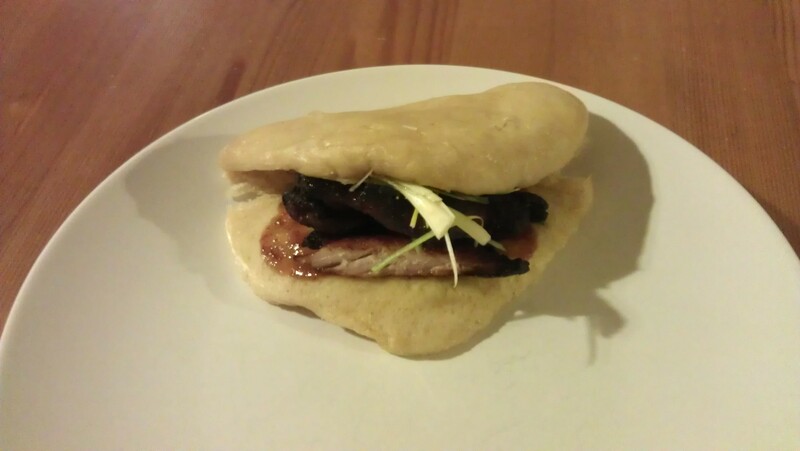 So, dense, soggy buns, burnt-to-a-crisp pork and no sriracha to be found – complete catastrophe. Now the sadness has lifted – some of it, anyway – I can see that perhaps I cut the pork the wrong way (having sliced it on the short side rather than the long side), so maybe that was why it burned so quickly. However, the recipe did not specify this as it suggested using store-bought belly slices rather than slicing your own. Also, having returned to my pantry, I realized that my baking powder went out of date in 2010. Shock horror! (I am obviously not baking enough.) So perhaps the buns did not rise as they should have because the baking powder was ineffective to say the least. Maybe they would have been light as pillows if the baking powder had been fresher. Still not wanting to admit defeat, I managed to eat one and a half pork buns with some green onions and a dash of hoisin and they were just about edible once the buns had dried out a bit – my husband had his salvaged pork in a baguette. All told, I think this might be one of those things I leave to the professionals and just enjoy on a jaunt through Chinatown, or maybe I’ll try again. You never can tell. My baking powder expired in 2005 and it’s still good. Who knows then? It was a porky disaster.